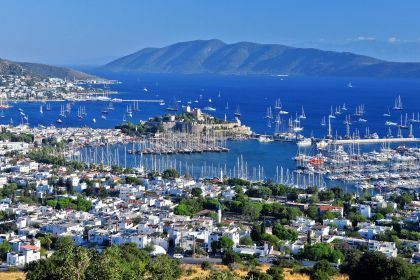 Choose to charter a yacht in Bodrum for an elite, pampered yacht charter holiday in this prosperous Turkish resort town. Nestled in Bodrum Bay, Bodrum is Turkey’s premier resort, drawing an elite crowd from Istanbul and abroad to its shores. Warm, cobalt-blue water and numerous lovely beaches in secluded bays sheltered by scenic rock formations translate into a veritable paradise for anyone who loves the great outdoors and active fun. Be charmed by this enigmatic hideaway, with its sugar-cube white buildings - no higher than one or two storeys - reminiscent of Greek architecture. No wonder this place is so loved by artists, whose galleries attract a large number of visitors. 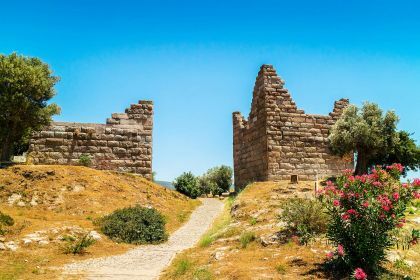 The town has a fascinating history, as it was built on the site of the ancient city of Halicarnassus. 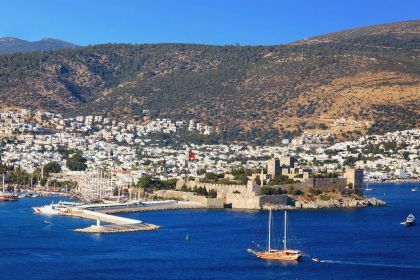 Bodrum is an excellent base for exploring secluded inlets and small bays in surrounding waters, and also a good starting point for chartering a yacht along the Carian coast or Turkish Riviera. Just outside of Bodrum city you’ll find the Mandarin Oriental - a luxury hotel and resort with two private beaches, a kids’ club, gourmet restaurants and posh boutiques, and most importantly, their premier spa, fused with the world-famous Mayo Clinic. Spend a couple of hours enjoying the Turkish hammam, award-winning signature treatments and gorgeous restorative rituals, and then choose from their selection of restaurants if you fancy a bite to eat. 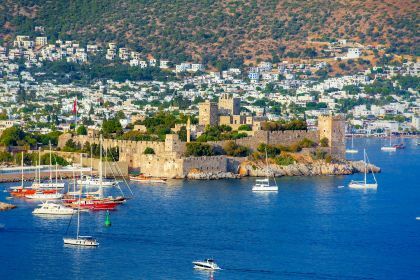 For a dose of history and culture you can visit the Bodrum Castle, built by crusaders in around 1402. It now encompasses the world-famous Bodrum Museum of Underwater Archaeology. This impressive museum showcases relics from shipwrecks around the Turkish Aegean over the past 3000 years. You can also visit the remains of the Mausoleum of Halicarnassus, one of the original Seven Wonders of the World. Insider tip: Bodrum is a shopper’s paradise, and a particular favourite of the upper echelon is Ipekce (İpekçe), where you can shop really unique jewellery, home decor, clothing and gorgeous beach kaftans. You’ll find the boutique shop in the trendy neighbourhood of Turkbuku (Türkbükü). You’ll find plenty of excellent dining options in Bodrum. Indulge in Turkish mezze and fresh seafood at one of the many restaurants, some offering fine-dining and others that have more casual settings. For something ultra-luxe and discreet, Michelin-starred Il Riccio's Bodrum branch, part of the exclusive ten-room boutique hotel, Il Riccio Beach House. Here, resident chef Giovanni Caiazzo from Naples skilfully prepares gazpacho-style soup with green peppers, red prawns, ricotta cheese and crostini and of course the restaurant’s specialty: seafood. Make the most of the gorgeous weather and dine on the terrace which overlooks Paradise Bay. After dinner, move on to the Temptation Room for a selection of rich desserts from tiramisu to Neapolitan pastries. Another top choice for seafood is Orfoz, where you can enjoy fresh oysters with parmesan, smoked eel, baby calamari with onions and garlic, scallops, sea urchins and blue crab. And Bodrum’s most beautiful boutique hotel, Macakizi (Maçakızı), boasts a fabulous restaurant with upscale dining. Be sure to order a cocktail at the beach bar, just steps from the mesmerising water in the small bay of Turkbuku. Bodrum is awash with bars and nightclubs, it’s really just up to you as to what tickles your fancy. You’ll find a selection of top tier beach clubs, which offer tranquil relaxation during the day, and DJs, drinks and dancing come nightfall. Xuma Beach Club, T.A.Y Beach Club and Sebastian Beach Club are just a few of the marvellous locales on offer. Night owls might enjoy the revelry of the Billionaire Club. Known for attracting a global jet-setting crowd, it’s located on the private island of the Palmarina. A yacht charter experience in the Turkish Riviera is something the whole family will remember for years to come. Your charter broker can help you select a luxury yacht with all the trimmings to keep the kids entertained on your charter vacation. Your superyacht can be equipped with water-skiing and wakeboarding equipment, and perhaps a couple of kayaks. If your kids love snorkelling, there are plenty of nooks and crannies for them to explore below the surface of the Aegean. The Aegean Coast is chock-a-block with incredible snorkelling spots, and the incredible underwater life will keep kids entertained for hours. The sandy beaches on the Bodrum Peninsula are perfect for kids to play and explore, with sand soft enough not to hurt little feet, and they may also be impressed by the traditional gulets sailing in the bay, especially if they are fans of Pirates of the Caribbean! Charter conditions are generally good in and around Bodrum, with temperate weather throughout the year. In the summer, the Meltemi Winds can affect sailing conditions in the Aegean. However, even if these winds are active, an experienced captain will know to plan the departure times and itinerary so that the weather has little to no effect on your perfect holiday at sea. Chartering a solid yacht with stabilisers will ensure smooth sailing as you traverse the brilliant blue waters of the Turkish Riviera. If you’re drawn to The Turquoise Coast (and who wouldn’t be? ), consider chartering a catamaran, sailing boat, or luxury superyacht. Our Abberley charter broker can arrange for an unrivalled yachting adventure at sea in this extraordinary part of the world. If there’ll be kids on board, we can arrange for any necessary extras to create a wonderful pampered adventure for the entire family. Drop us a line here or give us a call for an unsurpassed sailing experience in Bodrum.